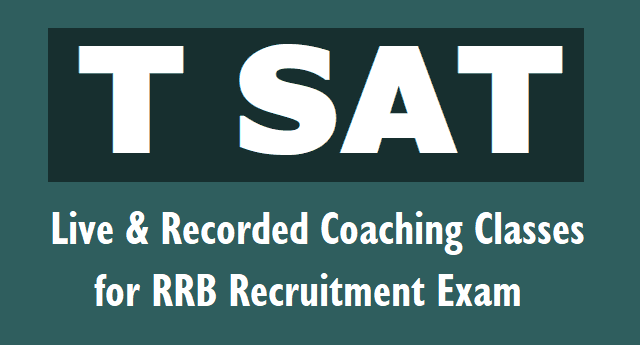 T SAT Free Coaching Online Classes for RRB Group D Posts Recruitment 2018: T SAT Video Classes, 45 Days T SAT Free Coaching classes for RRB Group D Posts Recruitment 2018, T SAT Live Recorded Coaching Classes for RRB Recruitment, Telangana’s T-SAT to telecast free coaching classes for RRB Group D Posts Recruitment Test: Mana TV Online video Classes for RRB Group D Posts Recruitment, T SAT Nipuna MANA TV live coaching classes for RRB Group D Posts Recruitment, TS SAT Mana TV Training Programmes, SoFTNET MANA TV Channels Telecast schedule for RRB Group D Posts UDYOGA GUIDE: Udyoga Guide, MANA TV RRB Group D Posts Recruitment Training Classes, T SAT MANA TV Live Classes for RRB Group D Posts Recruitment. RRB Group D Posts Recruitment Udyoga Guide would be telecast daily from 02-04-2018 by 45 days. T SAT Mana TV to telecast Online video Coaching classes as RRB Group D Posts Recruitment exams from April 2. The Telangana State-run education channel, Mana TV will telecast coaching classes for RRB Group D Posts Recruitment examinations to help students from rural and financially backward families.